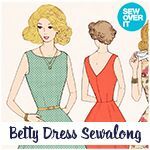 The moment I saw the Betty dress pattern from Sew Over It, I knew I wanted to make one and I bought a copy of the pattern just as soon as it was released. I had planned to join in with the Betty Sewalong but it coincided with our honeymoon (as much as I love sewing, the honeymoon won!!). Anyway back from honeymoon and fabric purchased from Croft Mill, I got to work using both the pattern and the sewalong instructions. I chose the Navy Caroline cotton poplin and this was perhaps my first mistake (but I loved the fabric so I persevered!). I hadn’t take into account the one way design until I started laying out the fabric. I realised that if I cut the pieces as indicated, the pattern on the skirt would be upside down relative to the bodice. Luckily, I had enough fabric to alter how I cut the skirt pieces. The main change was the I cut the front skirt as two pieces, rather than on the fold. I attempted to match the pattern running down the centre front and centre back (bodice and skirt) – it’s not perfect but I’m pretty pleased with the result. I had been a bit worried about the construction of the dress as Sew Over It list it as a level 6 pattern and I’m only getting back into dressmaking now after many years. But actually, the instructions were really clear and easy to follow and the Sewalong helped a lot. The most satisfying parts were stitching the darts on the bodice and seeing the way it fit and inserting the invisible zip (which I did without an invisible zip foot, as I don’t have one yet). The only thing that doesn’t look as good as I hoped was the top of the zip – somehow after stitching the facing on the top of the zip was not even on each side. But after easing the facing a little bit, it doesn’t look so bad. Anyway, I’ve already worn the dress once and I can see many other occasions when I’ll wear it. It’s definitely the best garment I’ve ever made! My sister bought me the Ultimate Shift Dress pattern for my birthday, and I’m very much looking forward to making it! Photographs taken by Mr Stepherella! The slightly uneven zip top, although the zip itself is beautifully invisible even without the use of an invisible zip foot. Thanks! And any time!! She looks like she might have a bit of a crafty side with all the loom band stuff she’s been making!